The image of the evening was hatrick hero Raheem Sterling leaving the pitch to a standing ovation and clasping hands with Callum Hudson-Odoi as he came onto the pitch for his debut in England’s first team. With Gareth Southgate standing and applauding in the background, this was a moment to only encourage supporters of England further that the future is so promising. Sterling had been exquisite in the 70 minutes he was on the Wembley turf. 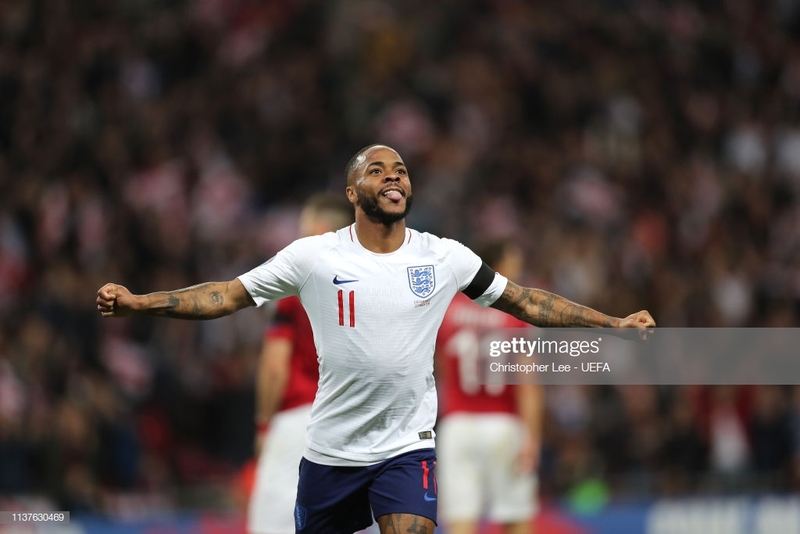 It is difficult to upstage the likes of Harry Kane when in the white of England, but Sterling with his deftness of touch and composed thinking when in precious scenarios stole the spotlight as England got their European Championship qualifying campaign off to a winning start. The evening began with silence and reflection. A moments pause for England’s World Cup winning goalkeeper Gordon Banks who passed away last month. Ahead of last summers World Cup, Banks was one of a few former England greats to send hand written messages of support to the squad of 2018. Another example of Banks the gentlemen as well as England legend. It was thus fitting that Jordon Pickford, England’s current No1, played such a crucial part in the run to last year’s World Cup semi finals. Also the fact that the Everton goalkeeper was able to put aside some wobbly domestic form to keep a clean sheet for his country here in front of Banks’ family, who were in the royal box, was appropriate. It meant England’s qualifying campaign began almost perfectly. And it was mainly thanks to Sterling that England’s feel-good factor, having qualified for this summers UEFA Nations League finals, continued here. His was a performance to only enhance the belief that he is England’s best player and possibly the best player in English football at the moment. A lack of calmness in the final third was always the stick used to beat Sterling, but no one can use that anymore. His hat-trick against Czech Republic showed that he has certainly added goals to his game now on a consistent basis. That’s now five goals in three games for Sterling in an England shirt and with a trip to Montenegro to come on Monday, he will be looking to add to that for sure. It was Sterling and England’s first goal on an evening of five that was the most eye-catching. A sequence of 25 passes featuring all of the team barring Dele Alli culminated in a perfectly measured Kane pass, a Jadon Sancho assist across the area and Sterling sliding in at the back post to score the 50th goal of the Southgate reign. It was a Manchester City-esque goal – dripping in such quality – finished by a City player. The goal not only meant a lot to Sterling but also Sancho, who was making his first competitive start for England. The assist he proved was inviting but his overall performance was encouraging too. There were times when he gave the ball away a little carelessly but his attitude and aptitude on the national stage were evident. The skills and drive that Sancho offered up against Filip Novak may have come as a surprise to some; with his talent currently only being visible in the Bundesliga, it would not be wide of the mark to suggest that not too many will be fully versed with the promise and potential that Sancho is showing on a weekly basis. With Declan Rice coming off the bench along with Hudson-Odoi, the promise of this England team increases game by game. Southgate is desperate for there to be fierce competition both in the squad and the team. Options are what the manager wants, and when Eric Dier went off after 15 minutes and Jordan Henderson moved to the deeper midfield position and Ross Barkley came on in the more advanced role, the choices were there and clear. In truth, though, England could have had far fewer options and still have easily dispatched a weak Czech side. Considering Southgate was without a handful of first-teamers and had to reshuffle early on, the victory was even more impressive. Harry Maguire and Michael Keane were comfortable when dealing with Patrick Schick who was elegant and neat with the ball but all too often isolated. The visitors’ two closest chances of registering a goal came in the early stages of the second half when Tomas Soucek ducked and headed wide of the far post and David Pavelka shot straight at Pickford whilst on the turn. They were a level or two below their opponents and when Kane kept dropping deep bringing the Czech defence with him creating space in behind, his well-aimed passes forwards to Sterling, Sancho and Alli acted like effective slingshots. The display from England’s captain, which also contained his 18th successful penalty in a row, was full of craft and confidence. And that is what England have a lot of currently. Confidence and promise runs through this current side, instilled by Southgate and demonstrated by the likes of Sterling and Hudson-Odoi in another winning performance.